But, 23 Republican senators voted against the omnibus that Thursday. That Tuesday, however, only five Republican senators voted against killing a resolution that would have reasserted Congress’ own Article I war-making powers by invoking current law for its intended purpose and simultaneously stood against fiscally irresponsible perpetual war. This effort to restore the separation of powers outlined in the Constitution was led by the ever-principled conservative, Sen. Mike Lee (R-Utah). 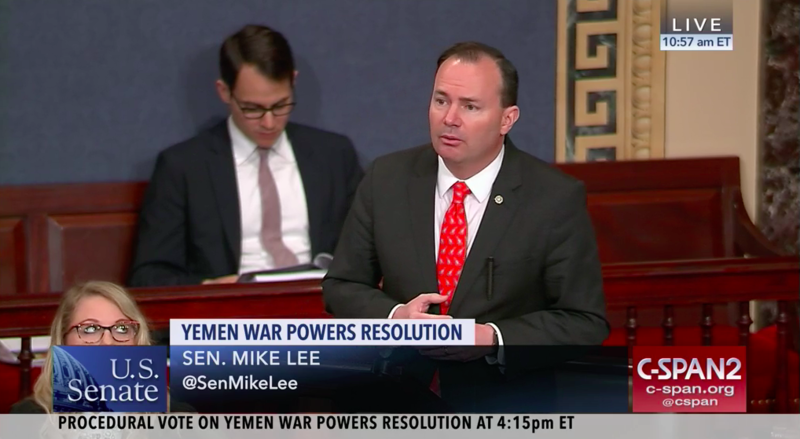 Senators and executive officials were quick to react to the storm that the Yemen War Powers Resolution, S.J.Res. 54, created both in the Senate and in the Department of Defense (DoD). The resolution would have simply removed U.S. military force from the blatantly unconstitutional -- undeclared, as well as unauthorized -- involvement in the Yemeni civil war, absent explicit congressional authorization. The military hegemon, the DoD, claimed relentlessly throughout the debate on the Yemen War Powers Resolution that two things were true. Firstly, they claimed that the resolution would have no effect because United States’ aid in the form of mid-air refueling, intelligence sharing, and targeting assistance to the Saudi-led coalition actively bombing Yemen did not constitute “hostilities.” Secondly, they claimed that the resolution if passed, however, would be absolutely devastating to United States’ interests, alliances, and strategic goals in the region. These two things cannot be simultaneously true. Either the resolution would have no effect because the United States’ engagement does not constitute unconstitutional hostilities, or the resolution would result in this engagement ending which would supposedly be devastating. This reveals just how threatened the military industrial complex felt by even the potential of Congress reasserting its rightful and mandated role in war-making. The hypocrisy of the DoD in vehemently opposing this resolution and investing significant resources in fighting it -- even sending Secretary of Defense James Mattis to speak directly to senators in a closed-door lunch the day of the vote -- while claiming that its basis renders it irrelevant anyway, was apparent. However, hypocrisy from the opposition to S.J.Res. 54 did not end with the DoD. Senators who spoke out on the floor during the hours of debate leading up to the vote on the motion to table the resolution, meaning motion to kill the resolution, came down strongly on both sides of the issue. To hear these arguments on either side of the debate that day -- with most Republicans willingly abdicating their constitutional responsibility in war-making to the executive branch, and Democrats standing alongside only one principled Republican Sen. Lee to vocally defend the necessity of adherence to the Constitution and existing law -- is shocking. Co-leads on the resolution Sen. Mike Lee (R-Utah) and Sen. Bernie Sanders (I-Vt.) passionately spoke in their opening remarks of the debate about the importance of following what the Constitution outlines with regards to war-making powers. They spoke as one would hope to hear all strict constitutionalist Republicans speak -- as members who recognize the importance of adhering to the words of our founding document. These arguments are consistent, convincing, and encouraging when viewed in the larger scope of our elected officials’ commitment to the document so integral to our country’s founding and continual success. There is not a hint of hypocrisy to be found among supporters of S.J.Res. 54 on the issue, honestly acknowledging not only the unauthorized nature of the United States’ involvement in Yemen, but also the potential to authorize it and even other conflicts going forward if they should be deemed necessary. This is what the Constitution requires. Hypocrisy runs rampant, however, in the opposition’s statements on the floor of the Senate last Tuesday. Sen. Bob Corker (R-Tenn.), the Chairman of the Senate Foreign Relations Committee, made last-minute arguments against the resolution, citing things as fact that have been previously unconfirmed or simply been confirmed as false. The disregard for rule of law and adherence to the core principles of the Constitution from Republicans is disdainful. Sen. Corker’s argument against the resolution centered on the idea, as he said on the floor of the Senate, that the sponsors of S.J.Res. 54 “have reached into the War Powers Act and pulled out something that was unintended for this purpose” -- that is, the purpose of Congress reigning in executive war powers. Once more, this is simply false and the text of the War Powers Act, and the context behind its passage post-Vietnam War, testify to the contrary. The text of the War Powers Act states that “It is the purpose of this joint resolution to fulfill the intent of the framers of the Constitution of the United States and insure that the collective judgement of both the Congress and the President will apply to the introduction of the United States Armed Forces into hostilities,” and that “[t]he constitutional powers of the President as Commander-in-Chief...are exercised only pursuant to (1) a declaration of war, (2) specific statutory authorization, or (3) a national emergency created by attack upon the United States, its territories or possessions, or its armed forces.” This clearly is the purpose for which the sponsors of S.J.Res. 54 called upon the War Powers Act. As the War Powers Act was enacted to help Congress carry out its intended role as the framers of the Constitution imagined it, one would think it would be supported by those Republicans who ran in their elections on a reverence of a strict interpretation of the Constitution. This respect for the Constitution and its original intent as imagined by the founding fathers is a core pillar of conservatism. The people who voted Republicans into office expect this of their elected officials, yet so many Senators chose last week to ignore both the Constitution and their constituents out of self-interest and fear. It should absolutely rattle these Republicans to the core that a true democratic socialist -- so often so horribly wrong on most every other issue -- took the floor of the Senate alongside one brave conservative, Sen. Mike Lee, and dominated the narrative of defending the Constitution that Republicans claim to own. Four Republicans joined Sen. Lee in voting against the motion to table S.J.Res. 54: Sens. Rand Paul (R-Ky.), Steve Daines (R-Mont. ), Jerry Moran (R-Kan.), and Susan Collins (R-Maine). Encouraged by Sen. Lee’s leadership on the issue, these Republicans were able to remove themselves from the fear-mongering of the DoD and war hawks in the Senate. Instead of being terrified of Congress being responsible in any capacity for our foreign policy decisions, these Republicans realizes that supporting the Yemen War Powers Resolution isn’t a matter of preference or even a matter of strategy -- it is a matter of the Constitution. I am so glade to present this helping guide line. there are more window10 user are connect the website http://mycomputerwindows10.com and earn the more important information to the website related.